From time immemorial man has been attracted to things that are rare. If the item in question is forbidden then that further adds to the allure. Look what happened to Eve in the Garden of Eden. Fortunately for Eve’s descendants, they don’t face such a predicament any more. We as human beings, in time have managed to yield a certain amount of control on the elements around us. This includes gemstones also. With the advent of modern technology and research it was possible for scientists to replicate the conditions that are found in the earth curst to manufacture gemstones. There are no differences what so ever between natural gemstones and wholesale synthetic gems like our wholesale created rubies and our wholesale created sapphires. Since the process is closely monitored and regulated in labs, wholesale synthetic gems tend to have fewer imperfections, more uniform coloring and can be made into new shapes which aren’t found in nature. If the customer demands it then we can add the imperfections in the stones, by taking the seed crystal of that gemstone’s growth process with inclusions and the same inclusion multiplies. We don’t have our own creating process, as this process is mostly controlled by the Russian rough manufacturers, we mostly use their rough during the production of our created gemstones in Bangkok. In the year-1819, Dr. E.D.Clarke, experimenting with a newly invented blowpipe, put two rubies on charcoal and melted them into one bead, he assumed it was glass. In 1837, Gaudin, a French chemist, evaporated what was a saturated solution of alum and potassium sulfate containing traces of potassium dichromate. Gaudin used an Oxy-hydrogen blowpipe for melting the residue and to drive off sulfur-dioxide gas and only leave the alumina. The small amount of potassium dichromate imparted the color to the alumina, which crystallized as it cooled. Gaudin had come to the erroneous conclusion that he had produced a synthetic ruby. Later more experimenters used different methods to crystallize the alumling. In every-case in which created rubies were produced, they were too small, thin and laminated to be of value as gemstones. The name of de Senarmont (1850) is remembered in connection with this early experimental work, but little definite information regarding its success can be obtained. His general method, next used also by Elsner, Sainte-Claire Devile, Caron and de Bray, was to form a molten mixture of salts in which alumina was soluble. Ebelman, in 1851, followed the earlier methods in producing small white sapphires by fusing alumina in boric acid. In 1877, Fremy and Hautefeuille crystallized aluminum Oxide, but of a molten bath in sizes large enough to yield small cut stones. First, they fused aluminum oxide and lead oxide, forming a lead aluminate; this was kept molten for a long period in a fire-clay crucible. The silica in the crucible combined with the lead to form lead silicate, and the alumina was liberated to crystallize as white sapphire. Then by next adding a chromium compound, small rubies were obtained. Fremy, working now with Verneuil crystallized synthetic ruby by a red heat reaction between barium fluoride and alumina containing a small amount of chromium. This process produced ruby crystals weighing about one-third caret. Although stones cut from these small crystals were tiny, they were the first of the synthetic gemstones to be set in jewelry. They used several methods, some utilizing sand crucibles of alumina and with potassium carbonate mixed with fine charcoal and packed around a core composed of alumina and calcium fluoride. This was heated gently for an eight-day period. Shortly after 1900, the brilliant Verneuil carried the work to a triumphant conclusion, making rubies of many carats and of great beauty and perfection. Although colorless sapphire and ruby were made readily by Verneuil, the color blue took some time to be manufactured. Unlike genuine ruby, the color of a sapphire does not return after cooling. Some various new experiments were made with a lower oxide of chromium to impart a blue hue, but to no avail. Luckily a series of experiments resulted in the discovery that titanium oxide was also necessary to produce a color resembling that of natural blue sapphire. It is only very recently that the mechanism producing this color has been fully understood. The titanium is largely lost in the process, but a blue color is imparted to the alumina. Now the method that Verneuil used is known today as the Flame Fusion Method. Many of the synthetic stones that we produce in our gemstone factory comes from this process. The raw material consists of extremely pure aluminum oxide along with approximately 5-8% of a chromium oxide must be added to produce the essential red color, Titanium oxide and iron oxide for shades of green and blue. Depending on the method being employed, additional chemicals may be needed. The flame fusion process uses an oxygen-hydrogen torch to melt powdered forms of the two basic components, but the Czochralski process uses electrical heating mechanism. The flux method uses a compound such as a lithium oxide, or a molybdenum oxide, or lead fluoride as a solvent for the raw material. The hydrothermal process uses a water-based solution of sodium carbonate as a solvent. A corrosion-resistant metal such as silver or platinum is used to line the vessel that contains the liquefied ingredients for the Czochralski, flux, and hydrothermal processes. 1. Flame Fusion- A fine powder of the aluminum and chromium oxides is placed in a hopper at the top of the Verneuil apparatus. A hammer atop the apparatus strikes the hopper repeatedly, causing a small amount of powder to fall through the fine mesh that forms the hopper’s floor. This discharged powder falls into a stream of oxygen that carries it down to a nozzle where it mixes in with a stream of hydrogen and is ignited. The intense heat of this flame melts the raw material and then it next falls onto a ceramic pedestal below the flame. Initially, the hammer taps at a rate of 80 beats per minute; after a suitable base for the crystal is formed, the rate is decreased to about 20 beats per minute. After the base is built up to the desired diameter (about 0.8 in or 20 mm) and formation of the high-quality crystal proceeds, the pedestal is lowered at a rate that just keeps the top of the crystal in contact with the flame. After about five and a half hours, the crystal reaches a length of approximately 2.75 inches. The gas flow is halted which extinguishes the flame. The crystal, now weighing around 150 carats, is allowed to cool. 2. CZOCHRALSKI PROCESS- Czochralski discovered this accidentally dipped his pen into a crucible of molten tin rather than his inkwell. He pulled his pen out to discover that a thin thread of solidified metal was hanging from the nib. He replaced the nib by a capillary, and verified that the crystallized metal was a single crystal. His experiments produced single crystals of a millimeter in diameter and up to 150 centimeters long. G.K. Teal and J.B. Little from Bell Labs in the USA used this method to grow single germanium crystals which led to their large scale production for semi-conductor applications. The raw material is heated much above its melting point in a crucible by an electric heater. A small ruby or sapphire crystal is attached to a rod; which act as the seed crystal. The seed is lowered into the crucible until it is barely immersed in the melt (the molten raw material). To maintain a constant contact temperature that is between the raw material and the entire circumference of the seed crystal, the rod is constantly rotated. As nutrient material attaches itself to the seed and crystalizes, the rod is slowly raised up, pulling the growing crystal out of the melt. The growing tip is kept in contact with the melt until the Raw material has been used. The rate of growth can be quite rapid, up to a rate of 4 in (100 mm) per hour. Very large crystals can be pulled, with diameters exceeding 2 in (50 mm) and lengths reaching 40 in (1 m) or more. Czochralski-pulling technique for growth of single crystal rods directly from the melt. This method is also used to grow whole sale created alexandrite. 3. FLUX GROWTH- Any material that when melted will dissolve another material that has a much higher melting point is known as flux. Temperatures in excess of 3,600° F (2,000° C) are required to melt aluminum oxide, the material will dissolve in certain fluxes at a lower temperature. Then while it is dissolved in the flux, mobile crystal molecules can travel freely and then attach themselves to a growing crystal. Some manufacturers immerse seed crystals into the solution, and others simply let molecules to combine randomly and form an unplanned number of crystals. The temperature is maintained for a time period of 3 to 12 months. Some manufacturers pour off the still-molten flux to expose the ruby crystals. Others cool the material slowly (2° C per hour) and then they extract the created crystals by breaking off the solidified flux or dissolving it in acid. This method doesn’t produce as flawless whole sale created Alexnadrites as those produced in Czochralski´s pulling method. The whole sale created alexandrite and wholesale created emeralds in this case has numerous inclusions as seen in natural counterparts. For manufacture of whole sale created Emeralds a crystal of beryl is used as seed crystal with an alumina flux along with desired impurities to get the color. In terms of natural stones there is a big difference between Emerald and Beryl Gemstones. 4. HYDROTHERMAL PROCESS- Powdered or crystalline raw material is placed at one end of a pressure-resistant tube. A seed crystal is mounted on a wire frame near the other end of the tube. Then the appropriate water-based solution is placed in the tube, which is sealed shut. The tube is placed vertically in a furnace chamber, with the nutrient containing end of the tube resting on a heating element as the floor of the furnace is heated, the bottom end of the tube becomes hotter than the top (about 835° F or 445° C, compared to 770° F or 410° C); dissolved nutrient material migrates toward the seed and then crystalizes on its relatively cooler surface. Pressure within the tube can range from 83,000-380,000 kPa. 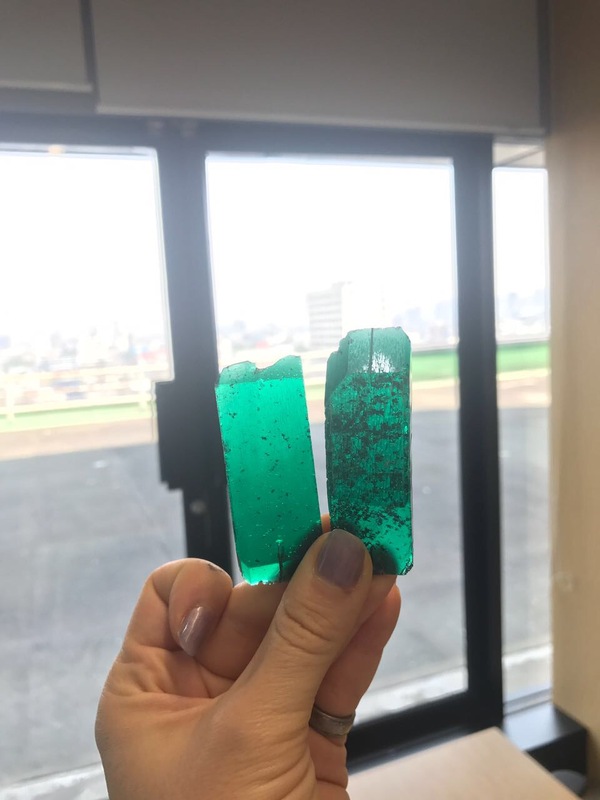 For manufacture of whole sale created Emeralds a crystal of beryl is used as seed crystal with an alumina flux along with desired impurities to get the color. Whether it will be used as a gem or an industrial device, the wholesale created rubies, sapphires, alexandrites and emeralds must be given a smooth, glossy finish after it has been cut or faceted to the desired shape. The following methods may be used. 5. POLISHING- The surface is rubbed with increasingly fine particles of an abrasive such as diamond powder. This technique leaves only microscopic scratches and pits. 6. GLOSSING- After initial polishing, the surface of the wholesale created ruby and wholesale created sapphire may be heated rapidly in a gas flame to melt any tiny projections. The surface is then allowed to cool, and the thin layer of molten material solidifies as a smooth surface. Treating wholesale created rubies, whole sale created sapphires, whole sale created alexandrites & whole sale created emeralds in this way nearly doubles the rod’s tensile strength. Presently due to advent of information technology leading to awareness and increased purchasing power of the younger generation, there is an increased demand for our wholesale created rubies and wholesale created sapphires, wholesale created alexandrites and wholesale created emeralds. Natural gemstones no doubt have their allure but wholesale created rubies and wholesale created emeralds are no different. Wholesale created sapphires, wholesale created alexandrites & wholesale created emeralds and other wholesale synthetic gems have the same properties be it physical, chemical and aesthetical. They have fewer imperfections and can be made in shapes not seen in nature. Diamonds have become too main stream these days Most of the diamonds now flooding the markets are CVD Diamonds (Crystal Vapor Deposition). Also the lack of variety in their color as compared to lab created rubies, lab created sapphires, lab created alexandrites & wholesale created emeralds doesn’t help its cause either. Wholesale created rubies, wholesale created sapphires, wholesale created alexandrite & wholesale created emeralds give the customer a variety of choices where the color is concerned but at the fraction of the cost. We at Navneet Gems & Minerals do have very much experience in the manufacturing process of these wholesale synthetic gems from the lab. One very important present trend in the created stones business is Nano sital. Nano sital comes from Russian labs and is created just like the same process but with a much superior quality and color and brilliance of the finished stones. These nano sital gemstones are very popular with wholesalers such as Russians, especially cannot afford natural gemstones due to their economy right now (2017), so they are using their country’s rough gemstones being cut mostly in India and Thailand. Navneet Gems can now cut Nano sital wholesale synthetic gems in many colors like: Nano Amethyst, Nano Citrine, Nano Swiss blue topaz, and Nano Sky blue topaz, Nano London blue topaz, Nano ruby, Nano sapphire and Nano emerald. We are mostly purchasing rough from direct sources. You can be rest assured that with Navneet Gems & Minerals you are in safe and secure hands. You can read the testimonials of our satisfied customers on Trustpilot.